I’m back with another gift guide for y’all and I’m excited because I had so much fun putting this one together! Every item on this list is either something I already own and love, or it’s on own Christmas wish list. Everything is under $100, most under $50, and will all arrive in time for Christmas if you order within the next week (including personalized items). 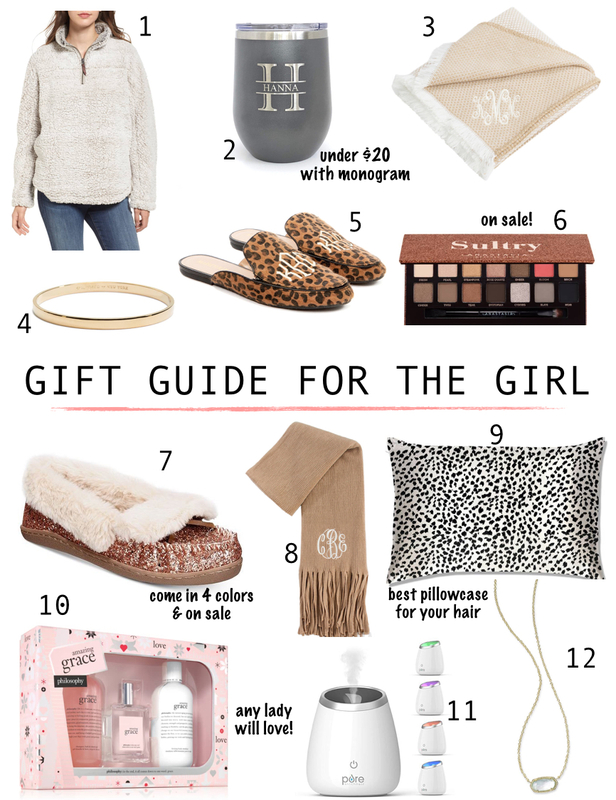 The hardest part was not adding another 12 things….I just might have to do a second gift guide for the ladies because there’s so many great gifts out and on sale right now! 1. Wubby Fleece Pullover (on sale for $49.90)- You’ve probably seen these “wubbies” everywhere and there’s a good reason- they are the coziest pullovers you’ll ever wear. 2. Personalized Insulated Wine Tumbler ($19.95)- What woman doesn’t want to drink her wine in style? If wine is not her thing, this also makes a great coffee or water cup. Comes in 9 pretty colors- I also love the white. 3. Monogrammed Woven Throw ($39.99)- I’m all about the monograms, as y’all can see, but there’s just something special about a personalized gift. This cozy throw is the perfect present and she’ll never believe it was under $40. 4. Kate Spade NY “heart of gold” Bangle ($32)- A timeless bracelet that she can wear alone or stacked with a watch. She’ll smile when she sees “heart of gold” engraved on the inside. Tis the year to give Kate Spade in honor of the fashion maven’s life. 5. Monogrammed Slide on Loafers ($59.99)- I have been eyeing these for awhile now and have dropped some hints to the little elves in my life. Leopard+monograms+comfy flats? Sign me up. Ladies of all ages would love these! 6. Anastasia Beverly Hills Sultry Eyeshadow Palette (on sale for $38)- This is an item on my wish list because I’ve heard such good things about the palette and I love the Anastasia brand. If you have a beauty guru on your list, she will go crazy over the 14 different shades from golden mattes to bronzy metallics. 7. Yasmina Faux-Fur Slippers (on sale for $34.65)- I couldn’t even wait until Christmas…I had to go ahead and order these for myself. They are so cute with the glitter detail and come in 4 colors (I got silver glitter). 8. Monogrammed Super Soft Fringe Scarf (on sale for $19.99)- Don’t walk, RUN to grab this while it’s under $20! These scarves are big, more like a blanket scarf, and so cozy. I have this in black but am ordering the camel for several girls on my list. 9. slip for beauty sleep Leopard Pillowcase ($85)- You may be wondering why a pillowcase would cost $85, but I’ve heard from countless friends that these are worth every penny. Made from pure mulberry silk, this pillowcase helps with anti-aging while you sleep (SO much better for your skin than a regular pillowcase) and helps prevent bedhead. Also allows you to go longer between hair washes. Lots of reasons to invest in one of these for yourself and your mom, sister, etc.! 10. philosophy amazing grace set (on sale for $46.75)- If you’ve never used philosophy products before, you are missing out! They smell divine and the quality is well worth the price. This sweet three piece set is limited edition- I ordered it for my grandmas. 11. Ultrasonic Aromatherapy Oil Diffuser ($39.99)- Converts her favorite essential oils into a fragrant, cool mist. Maybe she hasn’t jumped on the essential oil train yet or maybe she has and needs a new diffuser. Either way, this is such a great gift with amazing reviews! 12. Kendra Scott Elisa Birthstone Pendant Necklace ($40)- The sweetest dainty necklace that any lady on your list would love. She’ll love that you put thought into getting her birthstone, and most stones come with the option of both silver and gold metal. Boone is taking a record long nap, 2 1/2 hours and counting, and I’m not sure what to do with myself. I’m starving and want to head to the Chick Fil A drive-thru, but I should probably start on laundry instead. We have a busy next few weeks with holiday parties and it’s proooooobably somewhat important that we have some clothes to wear. I think all, or at least most, of us can agree that men can be some of the hardest on our list to shop for. I never know what to get my brothers, Dad, grandpas, or even Zach! 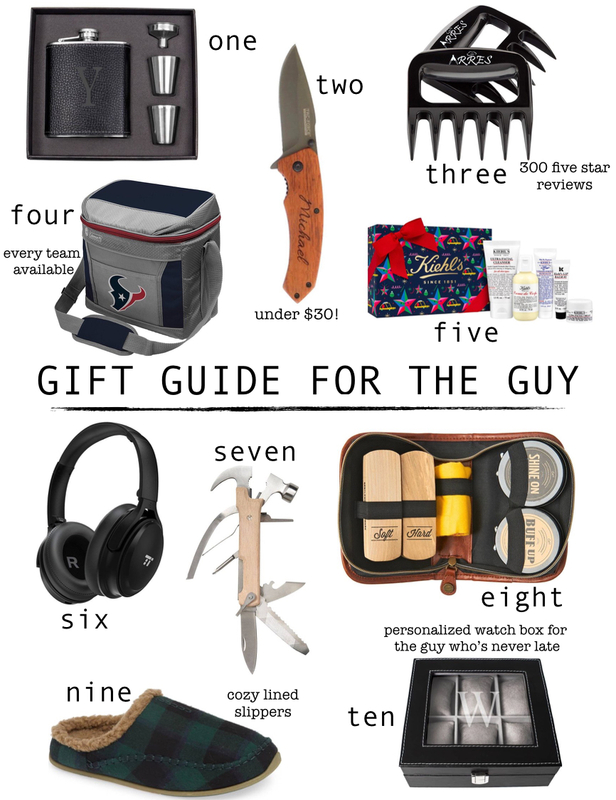 This year, I had Z help me compile a list of great gifts under $50 that any guy is sure to love; I hope this helps some of you as much as it has helped me! 1. I had never seen a tie case before and now I'm convinced that every man on our list needs one (especially for $49). This one is monogramed, adding a nice personal touch, and is great for the guy who travels. 2. If your guy loves beef jerky as much as mine does, this beef jerky sampler pack will be his favorite gift of all. You can't go wrong with a food gift and this one comes with fire, honey, and smoke flavored jerky all for just $21 (free shipping with Amazon Prime). 3. Hurry and grab this awesome fox print tie while you can- it's on sale for only $5 and your guy is sure to get a kick out of it! 4. If you're wondering if your guy (or any guy) would enjoy a neck massager, the answer is most definitely yes. I didn't think Zach would but I bought him one three or four years ago and he uses it all the time. This one is great quality for the price! 5. Every guy needs a pair of great, quality moccasins for those cold winter mornings and this pair by Minnetonka is great quality that will last for years to come. 6. Because a wireless charger is just cool. 7. I gifted some of these bluetooth beanies last year and the guys loved them- I was so excited to see they're currently on sale for $25 (reg. $40) so grab some at this price! They work for 8 hours between charges and have amazing reviews. 8. For the whiskey lover in the family, grab one of these Bar Cart Bibles for under $15 that's sure to get it's use and is perfect for displaying on a bar cart. 10. It's been proven time and time again that aviators are universally flattering on all face shapes, so snag your man a nice pair (that's just $25 with free shipping) to put under the tree. This style comes in seven different color options but Zach's favorite is the silver/black. 11. Okay so I may have fibbed a little here because this adidas duffel bag is technically $50 on the dot and not under $50, but it's just too cool to leave off the list. Such a great weekend or gym bag that also comes in solid black (but I love the pattern above!). 12. Everyone needs a back-up charger (you can never have too many) and this one is functional yet manly enough for any dude. 13. A shaving set is a practical gift that will be appreciated as well as used; unless your guy doesn't believe in shaving like my husband during the holidays (come January, he'll bust the razor back out- thank goodness!). I apologize in advance because I'm going to be a little MIA next week while we're in Paris- chances are I'll be too busy eating all the crepes to do much blogging :). But I'll post when I can and hope you all have a wonderful weekend!! Thank you for stopping by!